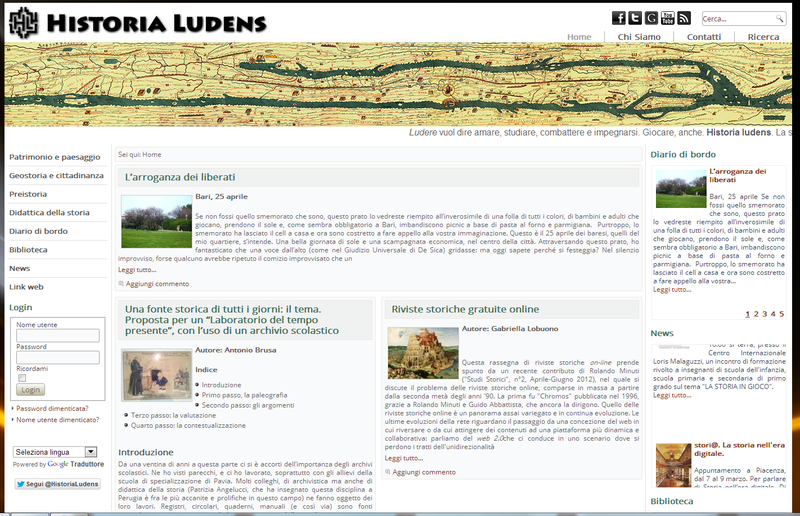 Segnalo il ben nutrito sito www.historialudens.it, curato dall’associazione Historia Ludens, istituita a Bari nel 1995 da docenti e laureati in didattica della Storia e in materie storiche. L’intento dichiarato del sito è “raccogliere professori, studenti e ricercatori per discutere di didattica, scambiarsi materiali, comunicare soluzioni didattiche e analisi sull’insegnamento della storia” (www.historialudens.it/chi-siamo). Le attuali sezioni sono: Patrimonio e paesaggio, Geostoria e cittadinanza, Preistoria, Didattica della storia, Diario di bordo, Biblioteca, News, Link web. Yesterday’s featured document from the U.S. National Archives was President Wilson’s address to Congress calling for a declaration of war against Germany in 1917. Looking at the document got me to look at some of my bookmarks for World War I materials. In that search I came up with four short videos on the origins of WWI. Those videos are embedded below. The first three videos above came from the channel History is Happening which contains some excellent videos for a wide range of topics in world history. The last video in the list came from All Histories which also has a great collection of more than 300 history videos. The BBC offers a virtual tour of a World War I trench that some of my former students showed me a few years back because they enjoyed it. The BBC also has some short films about WWI. There are six films that show students artifacts and images of a British soldier’s life during WWI. The films are sequenced beginning with recruitment continuing on to life in the trenches and ending with information about injuries and shell shock. The BBC also offers an animation of army movements from 1914 through 1918. Mission U.S. offers two interactive journeys through two important eras in U.S. History. The journeys are designed as role-playing games or missions. Both games can be played entirely online or downloaded for play on your PC or Mac (you do need an Internet connection to save a game in progress). The first mission in Mission U.S. is set in Boston in 1770. Students play the role of 14 year old Nat Wheeler who, after the Boston Massacre, must choose to side with the Loyalists or the Patriots. A video introduction is embedded below. The second mission in Mission U.S. is set in Kentucky and Ohio in 1850. Students take on the role of a fourteen year old slave named Lucy. In the mission students escape slavery in Kentucky and navigate to Ohio. A video trailer is embedded below. Playing Mission U.S. could be a good way for elementary school and middle school students to learn about two important eras in U.S. History. The Mission U.S. website offers an educators section that includes printable lists of vocabulary terms, writing prompts, and post-game discussion prompts. A similar resource from PBS that you might be interested in exploring isChronicles of the American Revolution. 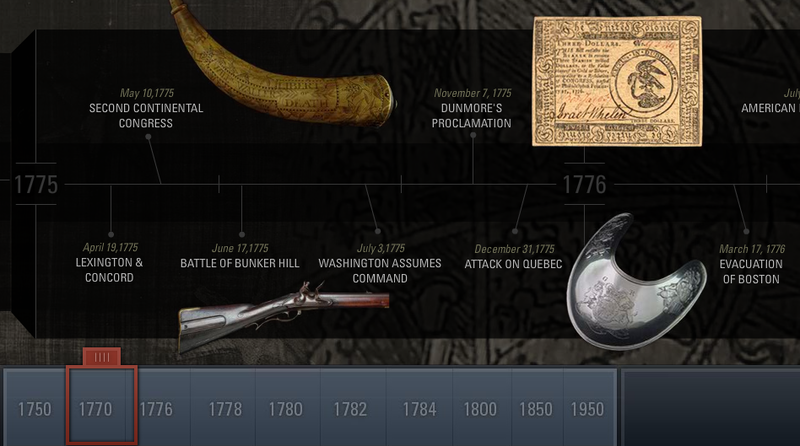 The American Revolution Center has a fantastic interactive timeline about the American Revolution. The timeline features an easily navigated combination of text and images. Click on any event in the timeline to view a short paragraph about that event. Click on an image of an artifact in the timeline and a you will see an enlarged image of that artifact. The page hosting the enlarged artifact image also hosts a description of the artifact and in some cases a video podcast about the artifact. It really is one of the best US History timelines that I’ve come across. The American Revolution Center’s timeline could be used as a primer for a study of the American Revolution or as a review of the Revolution. You might try challenging students to locate, online, images of artifacts representing each event on the timeline. In addition to a great timeline, the American Revolution Center offers a twenty question quiz and a lesson plan search engine. The American Family Through Time is a neat infographic produced by Archives.com (not to be confused with Archives.gov). The infographic laid out in a board game style. Every set of U.S. census data is available on the board. Click on any of the years to pop-up some highlights from that census. For example, if you click on the year 1900 you will see pie charts of information about occupations, education, and rural v. urban living. 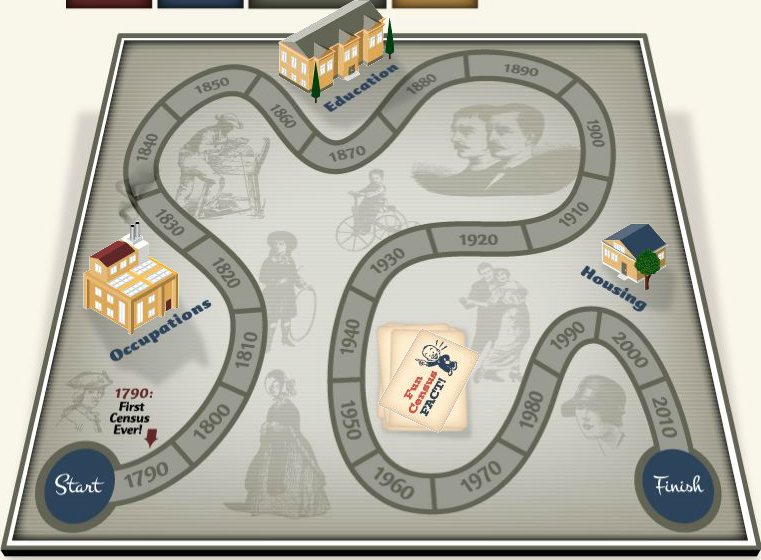 Click on the year 1870 and you can find out how many people lived in the typical household. You can click through each year’s pop-up display to see the actual census questions for that year. The American Family Through Time could be of interest to U.S. History teachers who want to pique students’ interest in historical demographic research. The American Family Through Time doesn’t display the same information for every census year. You could have your students create their own infographics of census data that displays the same information for each year for comparison purposes. 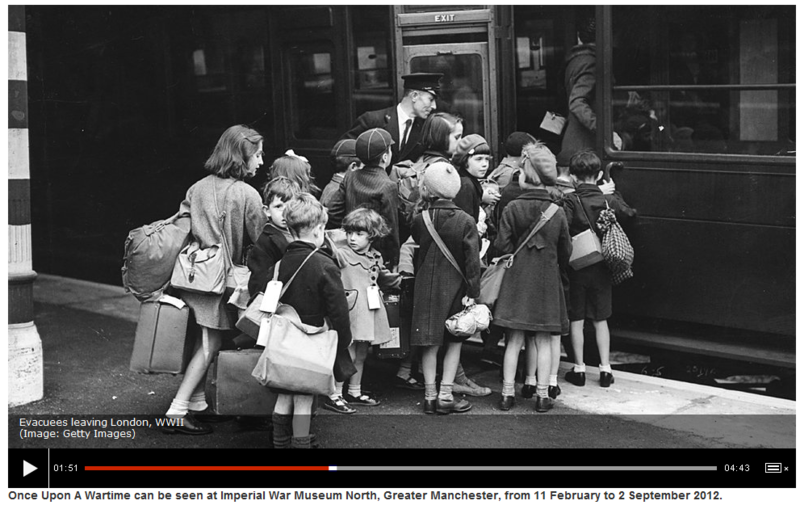 How War Stories Inspire Children to Learn is an interesting audio slideshow from the BBC. The presentation features Dr. Geoff Fox talking about three books and their influence on the way that children think about and learn about war. The three books Dr. Fox discusses are The Machine Gunners, War Horse, and Carrie’s War. The slideshow includes archival images of WWI and WWII in England. How War Stories Inspire Children to Learn introduced me to a couple of books that I’m going to add to my reading list. Perhaps the slideshow will do the same for you and you’ll want to add these books to your classroom. Inspired by a recent post on Google Maps Maniaabout Brock University’s The War of 1812 in Maps I decided to revisit a couple of similar resources. Brock University’s maps of The War of 1812 provides historical imagery of battle sites layered on top of Google Earth imagery. History Animated offers an online tour of the causes of The War of 1812, notable battles and strategies, and the outcomes of each battle. History Animated’s maps show troop movements throughout the war. Students can advance through the tour at their own paces using the fast forward, pause, and rewind buttons. 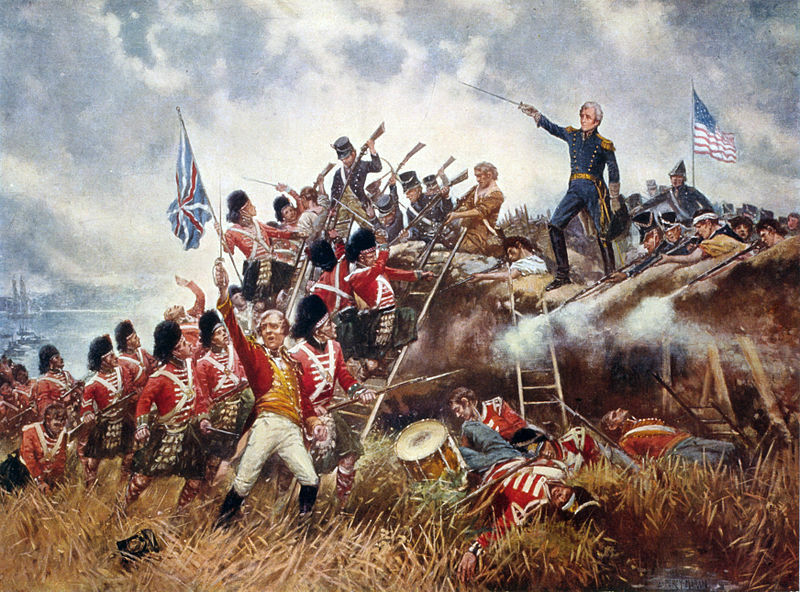 Learn Alberta has a nine-part resource providing maps of The War of 1812. The maps are arranged chronologically. Each map is accompanied by a short explanation. You can find a simple support document for the maps here. For history teachers in the United States, Learn Alberta’s resources on The War of 1812 could be useful for providing an alternate view of the war.